I was advised to go across the northern part of the Massif Central in France by a particular nice French lady. She suggested my plan of going directly west following the Eurovelo route 6 which follows rivers and is flat as being boring. Now I don’t know what the Eurovelo route is like but she was spot on about the Massif being beautiful. It has been so rewarding and coming off the back of the mental game that I mentioned before it was spot on with its timing. The last week has been for me why I started this trip, my love affair with the bicycle. Slogging up a hill for 10km was a rude introduction into the hills and as it turned out the longest climb of the trip so far. I guess that was me getting up on to the plateau. That probably isn’t the right word as it has been anything but flat. A rollercoaster would be a fair description, a corkscrew more accurate. Of course I’m not in love with cycling uphill for 10km in one go, I am however seduced by my ability to do it. After the best part of a week of the hills I was marvelling at the new found strength to keep going. It isn’t a in your face, bulging muscles, Clarkson shouting “POWER!” strength, it’s compact, it’s dense, it’s something deep inside that allows the legs to keep turning. Then of course what goes up, must come down. Down some hills that a mother would not approve of. Small single track roads, winding their way down the valley sides through forests and fields, over streams through tiny hamlets not marked on the map. I found my zone, where I move into that trance like state of total concentration, my mind is clear and focused. Intently scanning the ribbon of tarmac some 5 metres in front, searching for anything that will upset the rhythm of the bike. Using my body to set the bike for the upcoming turns and surface alterations, making small adjustments at speed with the brakes to move the weight around. My peripheral vision is scanning for anything else using the road, ready to scream the instruction through my central nervous system to make an emergency alteration in a split second as that is all I have. I only had to do it once and the bike stuck to the road like glue, squirming but staying straight, the weight of the luggage flexing the frame as the brakes are hammered on, wiping critical speed off. My confidence in mine and the bike’s ability to descend at speed merely adding to the thrill. 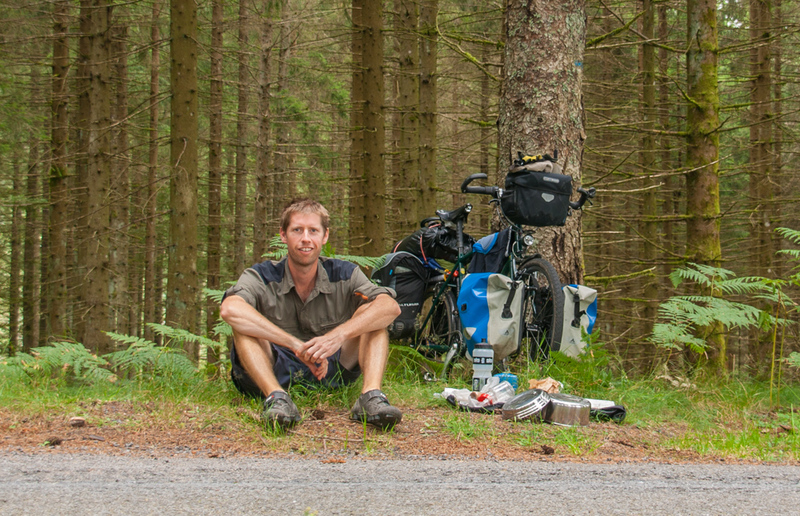 Possibly some of that confidence helped bring the balance back in my mental game with the wild camping as not only did I have epic days cycling, I found some great spots in the forests for camping with no one around and no worries. Balance restored and smile firmly restored! I’ve also realised how much closer I am to Spain than I thought I was. You know what? I might just do what I set out to do and that makes me smile from the inside. Glad to hear you’re enjoying the bike and scenery and that the smile is back. Coreze was amazing, the Dordogne was brutal. However through it now and can smell Spain, now wouldn’t that be something? Just the small matter of the Pyrenees to overcome, gulp! Which way are you going into Spain? We have friends in a little village called Villelongue del Monts on the eastern end of the mountains. I’m sure they wouldn’t mind putting you up for a night or two if you’re over that way. thanks Simon, that’s very kind. I am however going over the Pyrenees….on the western side. I had a look where that village is and it is somewhat of a detour!